If the system determines a collision is possible, it gives both visual and audible alerts, including a heads-up warning that flashes on the windshield. - Take appropriate action to prevent a collision (apply the brakes, change lanes, etc.). • Always keep the radar sensor cover clean. • Never use chemical solvents or polishing compounds to clean the sensor cover. Instead, clean it with water and a mild detergent. • Do not put anything on the radar sensor cover. 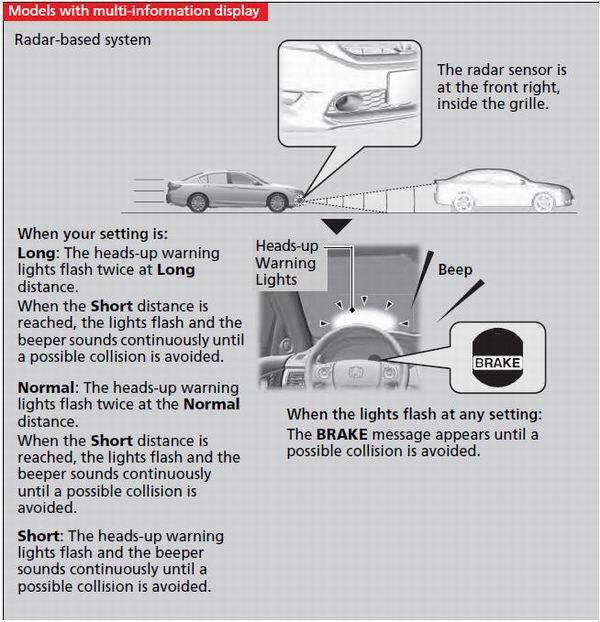 See a dealer if the radar sensor gets damaged or requires repair. 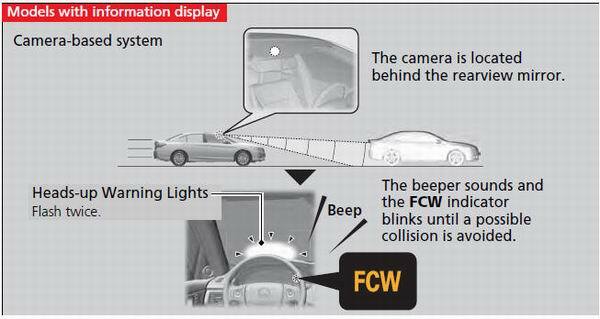 The camera is shared with Lane Departure Warning (LDW). 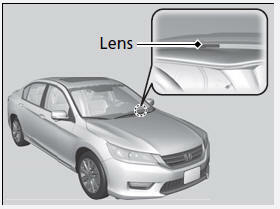 Never apply a film or attach any objects to the windshield that could obstruct the FCW camera's field of vision. Scratches, nicks, and other damage to the windshield within the FCW camera's field of vision can cause the system to operate abnormally. If this occurs, we recommend that you replace the windshield with a genuine Honda replacement windshield. Making even minor repairs within the camera's field of vision or installing an aftermarket replacement windshield may also cause the system to operate abnormally. • The temperature inside the system is high. • You drive off-road or on a mountain road, or curved and winding road for an extended period. • You drive in bad weather (rain, fog, snow, etc.). • The radar sensor cover is blocked by dirt, mud, leaves, wet snow, etc. • An abnormal tire condition is detected (wrong tire size, flat tire, etc.). • Start driving the vehicle to lower the windshield temperature, which cools down the area around the FCW system. 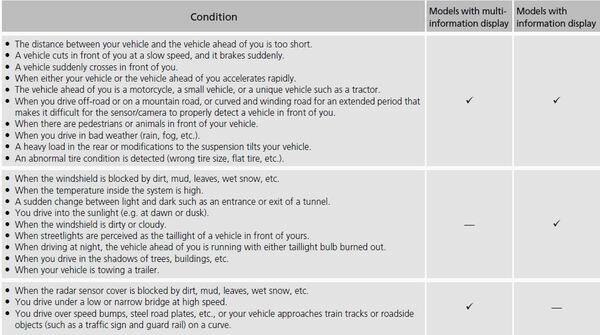 FCW may not activate or may not detect a vehicle in front of your vehicle, and may activate even when you are aware of a vehicle ahead of you, or when there is no vehicle ahead under the following conditions.